In addition to the many Maine Lighthouses that can be visited from land, there are several that require a visit by boat. Some of these are open to the public, if you can get there, while others are not open, some are even privately owned. 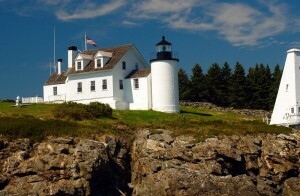 Tenants Harbor Light, also known as Tenants Island Light, is privately owned. In 1857 (this date is given by the U.S. Coast Guard, though some authors state the construction was 1854) a 27 foot tower was built on Southern Island, putting the light 66 feet above the high water mark. A work shed attached the tower to the keeper’s dwelling. The original tower was white and the dwelling brown. 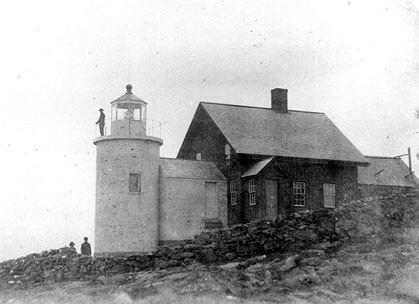 In 1934 the lighthouse was one of a number of lighthouses auctioned off by the government, and was bought by a resident of nearby Rockland, Maine. After passing through several owners, the lighthouse was bought in 1978 by noted artist Andrew Wyeth and his wife. It has remained in the Wyeth family since then, being presently owned by Wyeth’s son, Jamie, also an artist in his own right, and his wife. Andrew Wyeth build his studio inside the old bell tower, reportedly modeled on Lord Nelson’s quarters on his ship, Victory, reflecting Wyeth’s interest in history. There is also a period cannon visible on the grounds. The lighthouse is visible only from the water or air. There are lighthouse tours available in nearby Port Clyde, that pass close to the lighthouse, allowing very nice photo opportunities for visitors. Reportedly Jamie Wyeth will often appear to wave at the passing boats.